You're out and about with your laptop and you're in need of some fast internet connectivity. Here are some tried and true ways to find and get free Wi-Fi. You can find some free Wi-Fi love at the local public library, McDonald's, university campus, independent coffee shop or hotel lobby. Not all campuses offer free Wi-Fi though, so give the destination a ring before you hoof it over there only to be disappointed. Sometimes the built-in scanner on your smartphone or laptop can be too slow or won't give you all the information you want about area networks. Here are some free apps and tools for scanning and finding free Wi-Fi networks. When Windows' built-in Wi-Fi network detector isn't cutting it, download the free NetStumbler to get a detailed listing of available networks listed by channel, signal strength and security type, including "hidden" SSID's your PC might not detect otherwise. On the Mac, iStumbler is the free scanner application of choice. iStumbler offers an informative table of nearby hotspots, including their names, security mechanism, channel, signal and noise percentages, and MAC addresses. iStumbler hasn't been updated in a long time, and it didn't work as well as it used to on my Snow Leopard installation. For a pay-for alternative to iStumbler, check out AirRadar ($US16/license, free trial available). Smartphones: iPhone, BlackBerry, Windows Mobile, Android Your Wi-Fi enabled smartphone can scan for nearby networks using its built-in antenna, but a few apps let you search near your location or another location, too. On the iPhone, I got the best results from JiWire's Free Wi-Fi Finder, which searches areas by zip code or your current location. (You can also use the mobile JiWire webapp at iphone.jiwire.com.) Other iPhone Wi-Fi scanner apps include WifiTrack ($US1) and WiFiFoFum ($US3). On Windows Mobile, WiFiFoFum is available, and as Kevin pointed out, the WeFi app is also available for Android. Bookmark those in your mobile browser for future reference. Desperate times call for desperate measures. If your search for Wi-Fi is fruitless—or turning up only security walls—you've still got a few options. First, you can turn your smartphone into a router by tethering to its connection. 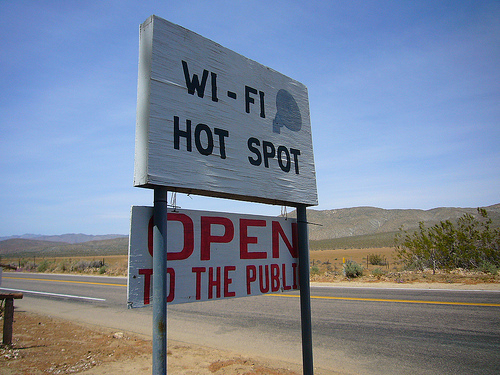 This isn't going to give you the fast connection that most public Wi-Fi hotspots will, but it will get your laptop online. Here's one method for enabling tethering on your iPhone 3.0. Android owners, the PdaNet app tethers your device to your laptop. In fact, PdaNet is a popular tethering app that works on Windows Mobile, BlackBerry, Palm OS and iPhone—though you'll need to jailbreak your iPhone to get it working. Finally, from the "don't be a jerk" files, if you absolutely have to, you can force your way onto a WEP-secured wireless network. Here's how to crack a Wi-Fi network's WEP password with Backtrack. Just because you can doesn't mean you should, of course—be prudent about hopping someone else's virtual gate. What's your favourite method, app or search engine for finding free Wi-Fi? Let us know in the comments. Gina Trapani, Lifehacker's founding editor, wishes you a neighbourhood blanketed in free Wi-Fi. Her feature Smarterware appears every Wednesday on Lifehacker. Some (particularly airport) networks are unencrypted, but still need a login. Over such networks it is sometimes possible to tunnel IP over DNS. Quite technical, and you need to be running your own server (or two). But sometimes possible. Are you talking about the segment that Hak5 did vik?